In a Spin: How our laundry is contributing to plastic pollution aims to help build understanding about the environmental impact of our clothes washing habits. Microplastic fibres are shed from synthetic clothing when laundered and pose a threat to marine life and the wider environment. In particular, the report explores the amount of synthetic clothing that people regularly wash and sets out recommendations for future action. 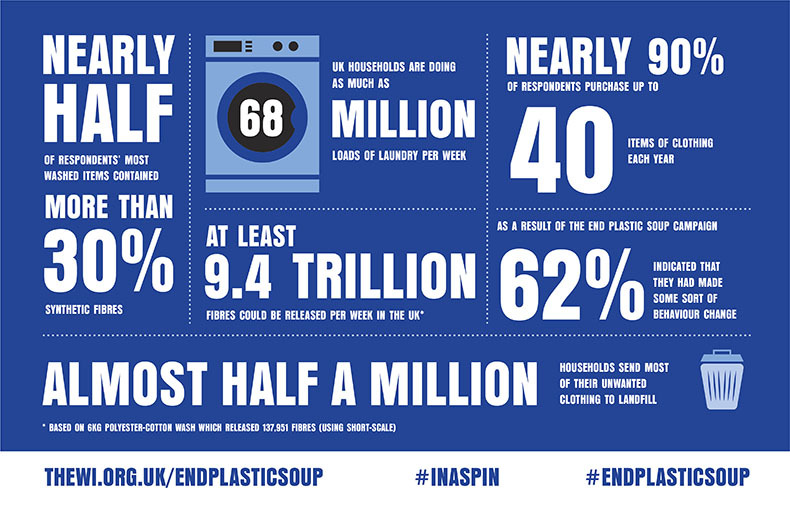 The In a Spin report is part of the WI’s End Plastic Soup campaign. Launched in 2017, the campaign calls for the development of solutions to reduce the amount of microplastic fibres, entering the oceans and wider environment. Learn more about the NFWI’s End Plastic Soup campaign.